On Monday, I followed Zack down a steep, rocky, and blind couloir on the Pinnacle that I was sure didn't go. When it did, I realized that all five north facing valleys of Archangel could be linked together into one tour by a series of couloirs. It wasn't hard to convince Brady, Alex, and Neil to forgo good snow and sun at Turnagain to try it. By sunrise we were high above Dogsled Pass and wrapping towards the entrance to Fairangel Valley. Across the way, the Mint peaks were lit up in the morning light. Buttressed by big granite walls, the aesthetic couloirs of Fairangel Valley hold a special place in my heart. Maybe someday conditions will line up to ski the Fair Five in one day. Back on top of Fairangel Ridge, Neil pointed us to our second line falling into the northwest Pinnacle Valley. Towards Anchorage, a sea clouds filled the valley as Neil dropped. Watching Neil ski forever below us, we realized the descent was longer than it looked. 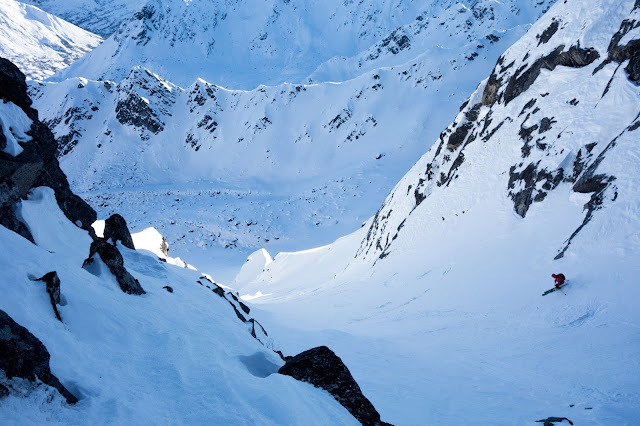 The second couloir - I'd love to come back for this one in better snow. Under the Pinnacle, we transitioned for our next ascent. I really like the northwest Pinnacle couloir - the top is overhung by a huge rock, and the rock is overhung by a huge cornice. Dropping in feels like skiing into a cave. A short skin brought us to the top of our next line. Perched on a loft on the north shoulder of the Pyramid, we drooled over Souvenir. Just to the right, Arkose Peak showed off its fat diagonal couloir. I'm working on selling the boys on a link-up with Souvenir. I skied first and was happy to find better snow than the impenetrable windboard of the first two coolies. In the soft snow Neil was able to open it up. Just lookers left is the banana couloir. I don't remember its official name, but I'm sure Ben Reynolds does. Now under the northeast face of the Pinnacle, it was time to head back up. A few years ago we found the crunched pile of bones, blood, and urine of a wolverine den here. Behind Neil is a lifetime of lines in Reed Lakes and Goodhope Creek. Brady skied first into the tight and winding couloir connecting to the backside of Microdot. 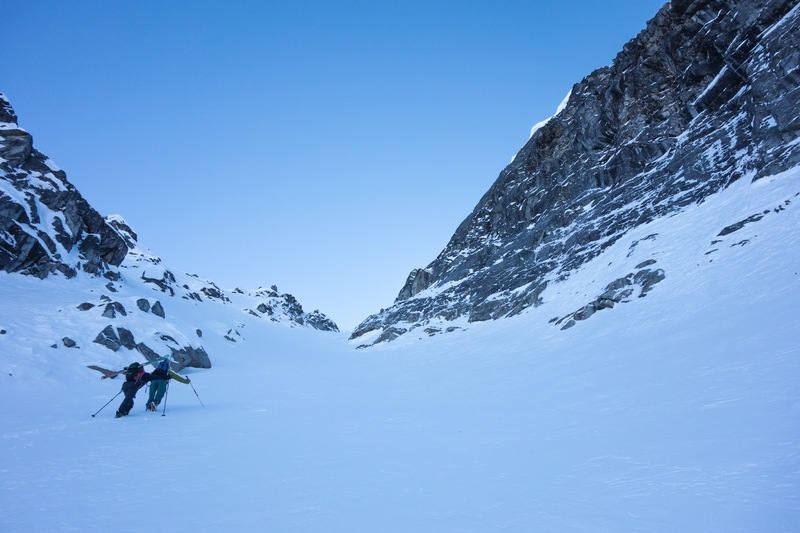 After negotiating the steep and rocky crux, it felt great to ski in the sun. The apron held more protected snow. Somewhere above Neil is the top of the Farside. From the backside of Microdot, we contoured up and across its west face to the top of the Rabbit Ears. Ready to begin our 5th run, Brady decided that he'd rather ski this one without his backpack or helmet. You'll have to ask him why. Neil wins the award for best jumps turns of the day. I hear there's going to be a rematch this spring on the Malignant Couloir. With sustained 50 degree turns thru tight walls, the Rabbit Ears couloir was the highlight of the day for me. The climb out of Sidney Creek ended with a steep and exposed booter across hard 55 degree snow. I couldn't help but think how it would have been substantially easier if it had been 5 laps earlier in the day. The reward was Marcus Baker shimmering in the evening alpenglow. Under the pink light of the setting sun, we headed for Rae Wallace. Then, in the fading light we ripped one last line back towards Independence Mine Valley and the car.